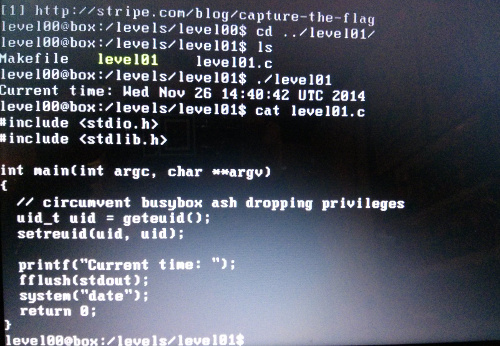 This post is about the first Stripe CTF, which happened in the beginning of 2012. I was able to fully reproduce the game by using a Live CD Image. Other options were direct download and BitTorrent. 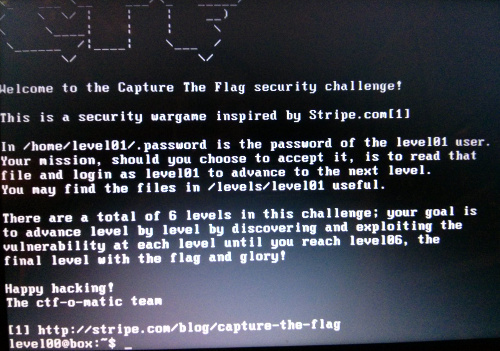 This CTF was composed of 6 levels, and its style was very similar to other Wargames I've talked about before in this blog (for instance, check OverTheWire's Natas, Narnia, and Krypton). A setuid binary (a binary with access rights that allow users to run executables with permissions of the owner or the group). The vulnerability becomes quite obvious! First, if you use printf to send text without a trailing \n to stdout (the screen), there is no guarantee that any of the text will appear so fflush is used to write everything that is buffered to stdout. Second, system executes any shell command you pass to it. In the case above, it will find a command through the PATH environment variable. It's clear that if we manage to change the variable date to some controlled exploit (such as cat /home/level01/.password) we get the program to print the password. Third, system outputs the date using a relative path for the PATH. We just need to change that to the directory where we keep our exploit (e.g., pwd) to have the system forget about the original date function. This level is about finding a vulnerability in a PHP script that greets the user with her/his saved data. The program implements this functionality by setting a cookie that saves the user's username and age. In future visits to the page, the program is then able to print You’re NAME, and your age is AGE. An obvious way to exploit this vulnerability is by building our own request that makes the program read the password at /home/level02/.password. Where the flag --digest enables HTTP authentication, and the flags -b or --cookie let us determine the cookie to be sent. Note: In the LiveCD this level is modified to use Python and Flask. Luckily, I had some previous experience in Flask (check out my Anti-Social Network) and it was pretty easy to spot that the Pyhton code does exactly the same thing as the one above. // This function is now deprecated. In problems like this, the attack surface is usually any place where there is input from the user. For this reason, our approach is to take a look at the arguments taken in the main function, checking for the common memory and overflow vulnerabilities in C.
1) We input a malicious index that is negative (so it pass the bound checking) to have a shell running system("/bin/sh"); (which will be able to read password of level3 because it will have its UID). So running an argument such as /level/level03 -27 foo calls fns[-27] which is &fns-27 times the size of the pointer. In this challenge, the input string is received by the function fun, and then it is copied to the buffer. Since strcp does not perform bound checking, if our string is larger than 1024 characters, it will keep copying until it reaches a NULL byte (0x00). This overflows the stack and makes it possible to rewrite the function return address. The input for the fun function is going to be 1024 bytes (which starts at &buf) with several NOPs plus the shellcode. The overflowed bytes have pointers to the address of buf (&buf). We use NOPs because the system uses stack randomization. If &buf points to any of the NOPs, the shellcode will be executed. Shellcode can either be crafted directly in Assembly, or reproduced in C and then disassembled in gdb and objdump. The second approach is more prone to errors. Now we are able to reproduce the code in Assembly. This is important: Stripe's machine were 32-bit, and the Assembly instructions are different from 64-bit (for instance, check the 64-bit shellcode I showed here). Add .code32 in the top of the Assembly code. Assemble with the --32 flag. Link with the -m elf_i386 flag. This solution is possible due to the struct module, which performs conversion between Python and C values, and the subprocess module, which allows us to spawn new processes. The struct.pack method returns a string containing the values packet in the specified format (where < means little-endian and I is unsigned int). The fifth level is an uppercasing web service written in Python, which is split into an HTTP part, and a worker queue part. So, the program serializes jobs with pickle, and sends them to a series of workers to deserialize and process the job. Once again, the attack surface is in the user input, which is not properly sanitized: this function allows arbitrary data to be sent to ; job. We can exploit it by making the serialization code execute arbitrary commands by supplying a string such as ; job: . This will run some Python code that will give us the password when unpickled. A great module for this task is Python's os.system, which executes commands in a subshell. And we have reached the sixth level! Welcome to the password checker! $ Ha ha, your password is incorrect! This turns out to be a case of Timing Attack, where we are able to detect the output in stderr and in stdout to find the characters that form the password (by checking the response to wrong characters). The program works as the following: for every input character, a loop is executed. A dot is printed after each character comparison. If the guess is wrong, the system forks a child process and runs a little slower (each loop has complexity O(n^2) to the guess size, where the maximum size is MAX_ARG_STRLEN ~ 0.1 MB). Pickle Modules is unsafe! Here and here. Some other writeups: here, here, here, and here.